I can finally announce on these interwebs the exciting and fun things happening right now. I let my employer know last week that I will be leaving my position so I can attend school at the University of Illinois at Chicago for a Master’s in Urban Planning and Policy this fall! Better yet, my current employer offered me a part time position – a win-win since they can still use me for several projects, and I can still earn an income and go to fancy dinners. June 28: Fly to Cancun, head to Cozumel, learn to dive! Yay! 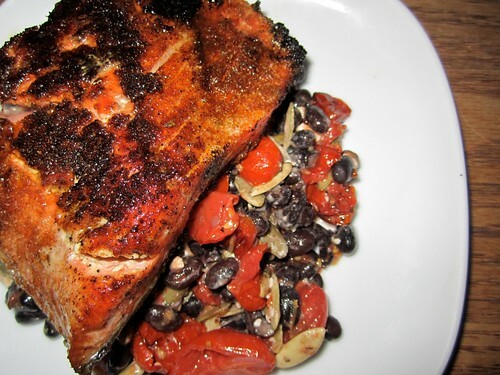 More details on these exciting developments later, but for now: blackened salmon. Yum. Sorry for the poor quality of pictures – I snapped these around 9pm back in the day when leaving work at 5pm meant going home in the dark. Mix the spices together and set aside. 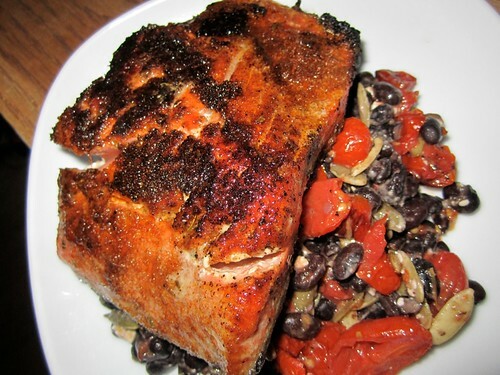 Coat the salmon with the spice rub and let it sit for approximately 10 minutes. In the meantime, heat a pan with some butter or olive oil to medium high heat. Pan sear the salmon until the insides are opaque and the outside is nice and crisp. That’s it!